Believers pray as 4th anniversary of Japan’s triple disaster is remembered. Japan (MNN) — Yesterday marked four years since Japan saw the worst triple disaster in the nation’s history. The country had a moment of silence yesterday, March 11 at 2:46 p.m. (0546 UTC), the exact moment a 9.0-magnitude undersea quake hit the northeast coast of Japan. Remembrance ceremonies were held near the devastated cities and villages on the country’s northeast coast. Many joined hands in prayer or bowed their heads during the national minute of silence. In Japan’s capital, Tokyo, Emperor Akihito and Empress Michiko also led tributes to those who died in Japan’s worst peace-time disaster. 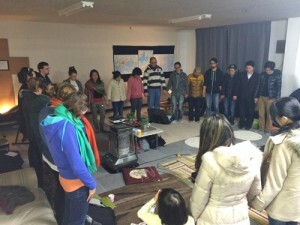 During this tragic time in Japan’s history, many people came to know Jesus and are now attending church. If you're interested in going to Japan, visit www.go2japan.org.